Writing and good music go hand in hand for the vast majority of us authors. 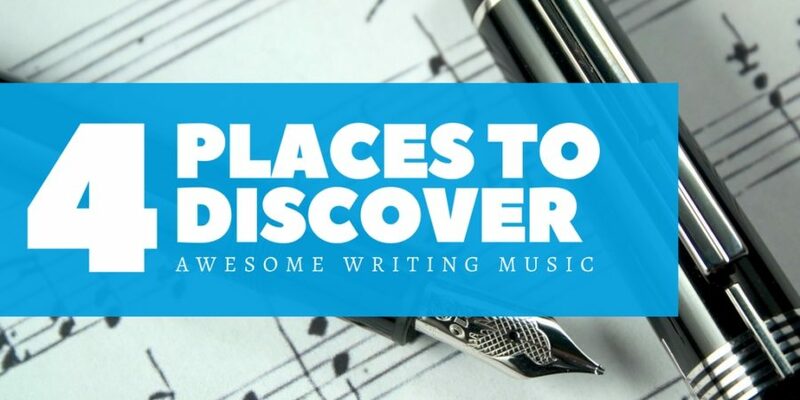 Here’s a list with some of the best places to discover, organize, and enjoy your favorite writing music. But first, let’s take a moment of silence to remember Grooveshark. R.I.P. Disclaimer: I’m not an Apple product user, so I can’t vouch for anything that starts with i-. If you use iTunes or other Apple services and programs to find writing music, tells us about it! Arguably the best music streaming software available, Spotify is a ridiculously useful tool for writers as well. Use it for creating personalized playlists based on mood or even entire books. Some music (especially soundtracks or composers) can’t be found on Spotify. If it’s old, obscure, or foreign (Nintendo music, for example), you may not find it. Think of Pandora as a writer’s radio channel. Create a station based on a song/genre/artist and let the software do the work for you. Completely free (someone correct me if I’m wrong; I don’t actually use it). The music never stops. Just click once and start writing. Great way to discover new soundtracks or artists. Tweak your station’s content by liking/disliking songs. Not available in many countries outside of North America. Talk about playing favorites! No way to save specific songs or playlists (that I’m aware of). Youtube is my catch-all option for finding writing music. It’s not the best, nor was it designed to be primarily a source of music, but it gets the job done every time. Hours of music mixes based on speficic moods (just search ‘scary ambient music’ and get to work). There are dozens of random websites that let you stream music based on filters (mood, genre, tempo, etc.). MoodFuse is a popular one. If you want something you’ve never heard before, or you just want to try something new, these might be a good option. A bit time consuming to find and learn how to use them. The music is hit or miss. Some sites are great, some are rubbish. If you can afford the monthly premium bill, I highly recommend using Spotify as your main source of writing music. In my opinion, it’s the overall best. For those times I can’t find the music I’m looking for, Youtube is my go-to second option. I use Youtube mostly for those long medleys and ambient mixes I mentioned earlier. And remember to listen outside the box! Hans Zimmer and TSFH are fine, but there are so many more amazing music creators out there. Start exploring! So what kind of music do you listen to when you write? What software do you use to discover new creators? When will Pandora finally let me stream in Spain? Let me know in the comments! Great list! Pandora is like Spotify though, you can listen for free, but can upgrade to Pandora One for an ad-free experience and more options. I like background/ambient sounds when writing. Some great options are Noisli, which allows you to create and save custom mixes of background sounds like wind, leaves, ocean, etc. Also RainyMood is great for realistic rain sounds. They have an option to listen to their daily Rainy mix, which is rain against a YouTube playlist. You can also create your own Rainy mixes. Awesome suggestions, Lisa! I hadn’t heard of Noisli before–definitely got to try that out. For nature/background sounds, I like A Soft Murmur, which lets you mix and match sounds and set timers. There’s also Mynoise.net and – -if you like that feeling of writing in a coffee shop no matter where you are — Coffitivity.com. Mostly I use ambient/New Age music for writing. I have a pretty good New Age station mix going on Pandora, but my favorite source is the Ultima Thule podcast, which gives you 75-minute blocks of ambient and atmospheric music (with just a bit of talking a couple times to give artist/track information, but IMO way less intrusive than Pandora’s ads).